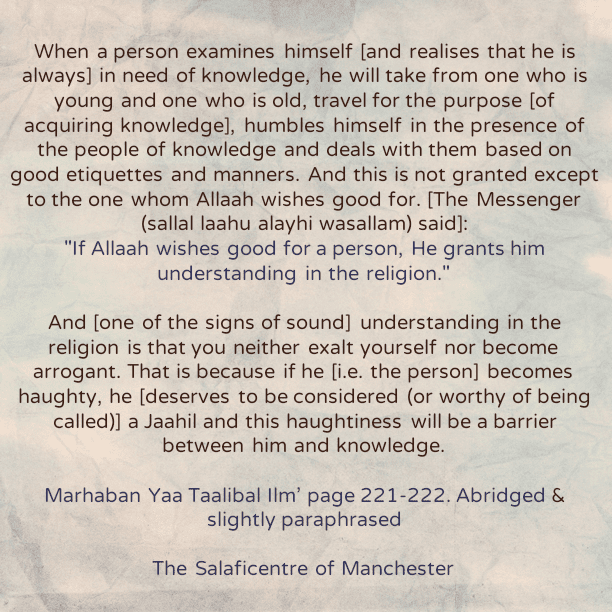 When a person examines himself [and realizes that he is always] in need of knowledge, he will take from one who is young and one who is old, travel for the purpose [of acquiring knowledge], humbles himself in the presence of the people of knowledge and deals with them based on good etiquettes and manners. And this is not granted except to the one whom Allaah wishes good for. [The Messenger (sallal laahu alayhi wasallam) said]: “If Allaah wishes good for a person, He grants him understanding in the religion.” And [one of the signs of sound] understanding in the religion is that you neither exalt yourself nor become arrogant. That is because if he [i.e. the person] becomes haughty, he [deserves to be considered (or worthy of being called)] a Jaahil and this haughtiness will be a barrier between him and knowledge.